About a year ago, we were at a friend’s house and she was telling us about her wonderful meals that she was getting from Blue Apron. It sounded so great and seemed like it would help differentiate dinners. I was determined to find a kosher version. So I stumbled across Fresh20. It doesn’t provide you with all the ingredients, but it does provide you with a weekly meal plan that is seasonal for 16 weeks worth of meal ideas. I will say there is a lot more meat meals than we are used to eating, but we have swapped out meat for “fake” meat products. I love that you can reuse ingredients for several different meals. Talk about not wasting food and having less leftovers. We bought the menu last January and I still don’t think we have touched all of the recipes yet. We have a couple that we constantly make because they are delicious. They have lots of meal plans and since you are buying the ingredients, you could probably also buy their Vegetarian meal plan. Starting for December, we started planning our menus a little bit more regularly and consistently. The idea builds upon Kosher on a Budget’s November Meal Plan. But instead of doing the exact same thing every week, we settled on the same type of thing for each night. Read more here. Our kids were actually dealt better with the meals when they knew what was coming up and could make a decision based upon the theme of the night. 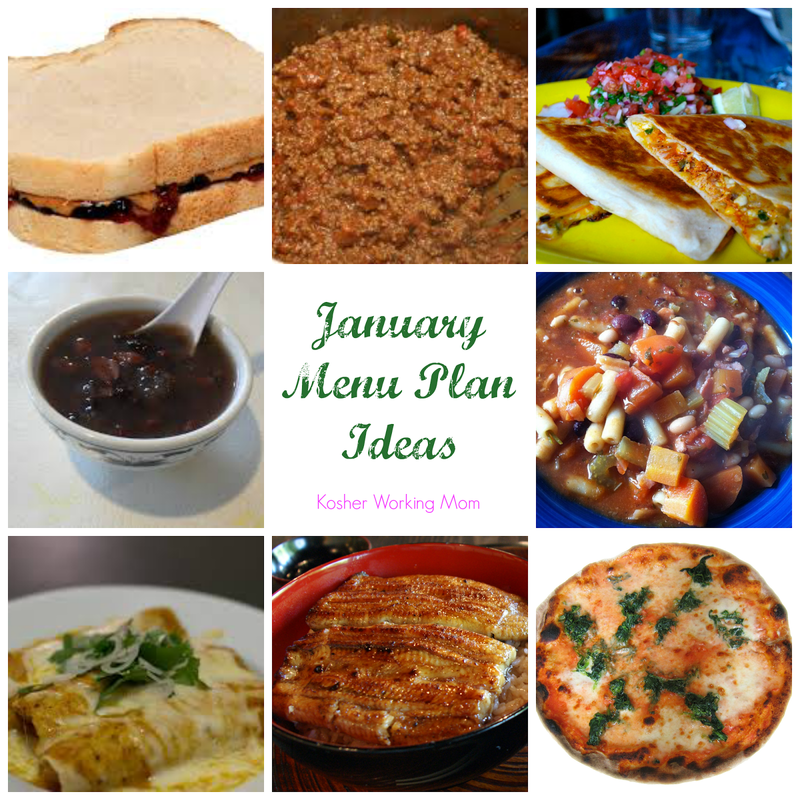 There is a lot of evening meetings in January, so I think we’ll need to figure out a lot easier meals. For January, we are going to try to stick to this routine, but add one night besides Friday Night that will be of Variety. We usually do Sandwiches for the kids as they are exhausted from the walk back and forth, especially when it’s cold and just need time to vedge. For the adults, we have been doing deli and soup. I’m always on the lookout for kid-friendly and interesting ideas for the whole family. Recently I found a Weeknight Meal Planner on Cooking Light. You drag and drop 5 Dishes and then you have a visual meal plan. Another site I often use that is great for kosher meal planning is Supercook. I love having all of my pantry items listed and then being able to choose which items I don’t want. When I have an ingredient that has sat too long in the pantry or refrigerator, it’s one of the first places I go for inspiration. I am starting to plan December and using the inspiration from Kosher on a Budget, I am going to stick with a couple routines for December and just vary it a little bit. At school Tuesdays and Thursdays are meat days, so I try to aim to do dairy on those evenings.